Recalling the incident of Mrs Flack and her terrifying hound the other day, I mentioned that I was kept occupied and entertained not by children’s television but by a comic. That set me thinking about the comics I read as a tot. At one time or another I was a devotee of The Beano, The Dandy, Wham!, The Topper, and Whizzer And Chips. I remember certain characters – Tupper of the Track, Billy Whizz, General Jumbo, and Grimly Fiendish, who bore a startling resemblance to the contemporary television person Dara O’Briain. They were all regulars, with their own strips, but for some reason burnt into my brain is another character who as I recall only ever appeared in a single story. This was an evil German secret agent called Weems, and I remember him simply because his name was Weems. It was the word, the sound, that caught my attention. And I have another fragmentary memory, of an episode in a story, which held me spellbound, but in this case I am not sure why. The story itself I have forgotten. It was a western, and I was not a great fan of westerns. Sure enough, my brother and I played Cowboys and Indians in the Newty Field, but when immersed in my comics I had more compelling claims on my attention – evil German secret agents, for example. But there was this one episode in the story which I have never forgotten. A cowboy had somehow managed to get himself lost and abandoned in the desert. He was at the end of his tether and had collapsed in the dust. Above him, vultures wheeled in the sky. The text made plain to my infant mind that, when eventually the stricken cowboy perished of hunger and thirst and exposure, the vultures would swoop down upon his corpse and gobble him up. At least, that is what the text intended to make plain. But I somehow misunderstood it. I thought the vultures would swoop if he closed his eyes. Not if he fell asleep, and thus looked as if he were dead. No, the vultures were circling, waiting for him to shut his eyes for an instant, at which point they would swoop, and tear him to pieces with their savage beaks and talons. Not surprisingly, my reading of the situation seemed the most terrifying predicament one could fall into. I practised lying in bed keeping my eyes open for as long as possible, desperately trying not to blink, to prepare myself for the inevitable time when I would be uprooted from a suburban council estate and tossed, alone and abandoned, into the desert. I kept an eye out for any vultures which might appear, looming with malignant menace, in the Essex sky. As a good Roman Catholic, I added a plea to be kept safe from vultures to my bedtime prayers. What strikes me, recalling this in the cold light of adulthood, is the astonishing lack of basic common sense. No wonder my mother used to warn me, in her thick Flemish accent, that “one of dese days you will go out widout your head”. That head now contained the unshakeable conviction that vultures filled the sky and were simply waiting for a person below to shut their eyes. You did not need to be sprawled exhausted in the desert dust. You might be scampering along on your way to the Newty Field, for example, and blink, and if a vulture were in the vicinity, it would swoop down upon you and rip you to shreds. I lived in a state of terror. What became of the cowboy in the comic strip? Did he somehow survive, or was he pecked to pieces? 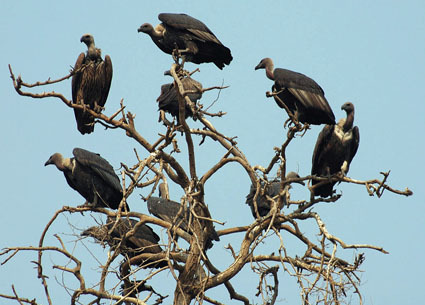 It may be that I was so unhinged by the thought of malevolent circling vultures that I stopped reading, and there and then began practising keeping my eyes open. When did it occur to me that I had never seen a vulture in the Essex sky? Or could I be sure I had not? I was, after all, myopic from an early age – possibly because I strained my eyes by attempting not to blink for protracted periods. All those birds up in the sky looked like vaguely similar blurs to me. I did know that a vulture was bigger than, say, a sparrow, but that was about as far as my ornithological knowledge went. How long did I live in fear of vultures? There must have come a point where I felt my prayers had been answered, that I had been kept safe, and, most cogently, not only had I not been attacked by vultures but I had never seen or heard of such an attack happening to anybody else. The day must have come, I presume, when I was able to go about my tiny business outdoors without giving vultures a thought. If only I had kept a diary at the time, I could pin down the date, for it was surely one of the signal moments of my childhood, that day when I peered up at the sky, a blue or grey blur, and consciously closed my eyes, without a care in the world. This entry was posted in Essays, Prose, Speak, Memory! by Frank Key. Bookmark the permalink.